Bruce spent a few hours in a auto salvage yard this past Saturday and he’s my hero. Why would my husband hanging out with broken down/smashed/torn up cars make me so proud, you ask? You see he left the house driving a car that could only transport our four boys plus one friend. When he pulled back into our driveway (my smiling face and waving arms greeting him) he drove the same car but now it could hold our four kiddos plus TWO friends. That’s right people. Instead of a car with second row bucket seats, given my hubby’s mad “underworld” search & rescue skills, we now are the proud owners of a second row bench! I really wish there were pics of my CFO hubby hanging out with “car guys” or climbing into a sawed-in-half suburban to reclaim some floor mat thingy. He describes it as an out-of-this-world experience. Only 15 minutes from home but light years different from our day-to-day reality. The pace was different. The priorities were different. 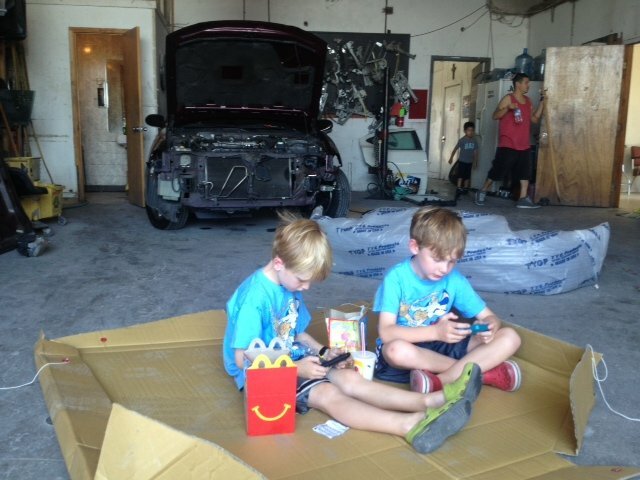 There weren’t even chairs for the boys to sit on while they ate lunch…so the “car guys” graciously offered my boys a cardboard box to sit on (I do have that picture). On the complete opposite side of the spectrum from junk yards, that Saturday night Bruce and I attended a charity event to raise money for Dravet Syndrome Research. One of Bruce’s co-worker’s helped planned the event, because he has a son, Caeden, with Dravet Syndrome. At the age of 9 months, Caeden was playing on the floor when he began to have a seizure, that seizure continued for an hour. The next 5 years Caeden continued to have frequent seizures and some more prolonged seizures. At one point this sweet boy spent 10 days in the ICU recovering from an epileptic episode (during that time he woke up and didn’t recognize his parents). My heart broke when I read story after story of children with this syndrome. Imagining the pain their parents have experienced–not knowing when the next seizure would come, how long it would last and would it take away the skills their child had developed (i.e., walking, talking, eating). You may be thinking, Heather, what do a salvage yard and a charity event have in common? And weren’t you supposed to review Lisa Chan’s new DVD? The feeling my husband felt while he was at the salvage yard, out of place and not at home, is the feeling we should have on this earth. These horrible things that happen in this life, children getting genetic disorders which traumatize a family, don’t seem right, because we live in a broken world. But you and I have a hope beyond this world. We can store “treasures in heaven” (Matthew 6:19) by showing Christ’s love to a broken world. Bruce returned kindness to those men who offered the boys a cardboard box. Bruce & I, in showing up at the event Saturday night, encouraged his co-worker that we care, we see their pain and we want to help find a cure for their son. I have to admit my favorite part of this DVD was not in the 17 minute video. It was in the 13 minutes behind-the-scenes clips, in which they interviewed Carolyn’s husband. He shared about growing up with an abused and abusive mother, about how he feared no one could ever love him, and how God completely redeemed his life. The generous folks at David C Cook are giving away a copy of this DVD to one of my readers. Please leave a comment and/or tweet about the giveaway to be entered to win. I would love this DVD and am going to check out the first two. Thank you so much!!!! Pick me, pick me!!! Lol! I have the first video, Be Still, I’d love to add another to my collection. I have never heard discipleship described as you just put it…”Go and make disciples. Even if you are just one step ahead…”. Being only two years in to my walk with the Lord (and learning more and more each and every day about what it means to walk w/Him) I have been SO hesitant to share the Gospel with those around me who don’t know the Lord, afraid I wasn’t “seasoned enough” or “mature enough” in the Lord to play that part in anyone’s life! Talk about an a-ha moment I just had after reading this post! 🙂 I’ve never seen any of these DVDs but they all look phenomenal … I’d love to win a copy! This sounds like an awesome study/video. I’ve heard a lot about it and have been wanting to see it! I’m with Erika! I loved when you said, “Go and make disciples. Even if you are just one step ahead”. Love that…really love that. Gal, this hits home. Just today a lawn guy was in front of my house doing a dance of pain. I was scared at first, but went out to see if I could help. He had disturbed a fire ant bed in a yard a few doors down and had been bitten several times. He was really in pain. I found some anti-itch cream in our medicine cabinet and smoothed the salve on his legs and arms. Really? Nurse J to the rescue. He was so appreciative, and I felt like I was Jesus’ hands and feet today. You never know what the Lord will bring to your doorstep if you are looking and asking to be His hands and feet. Thanks for this review and your openness! I love this as a reminder and would love the DVD too. Love that last quote- “lift your eyes to Jesus and what matters most comes into focus!” So good! THanks! An example of denying myself for my son from today is just the daily day-to-day sacrifices I make to give him the very best life possible. Oh this looks fantastic. I am always needing reminders of WHY we are here. It sounds like a great DVD and on a topic that we easily forget. I can’t wait to watch it.